Busy workers might be constantly on the move. You might need to have table mounts that are easy to adjust for those who are sitting or standing. Purchase the CotyTech Tablet Mount for Desk Clamp DM-IP4 to provide versatile, ergonomic solutions for your employees. Usually, sitting is the position that works the best for long periods of time. Your staff might need to enter essential data for your customers. 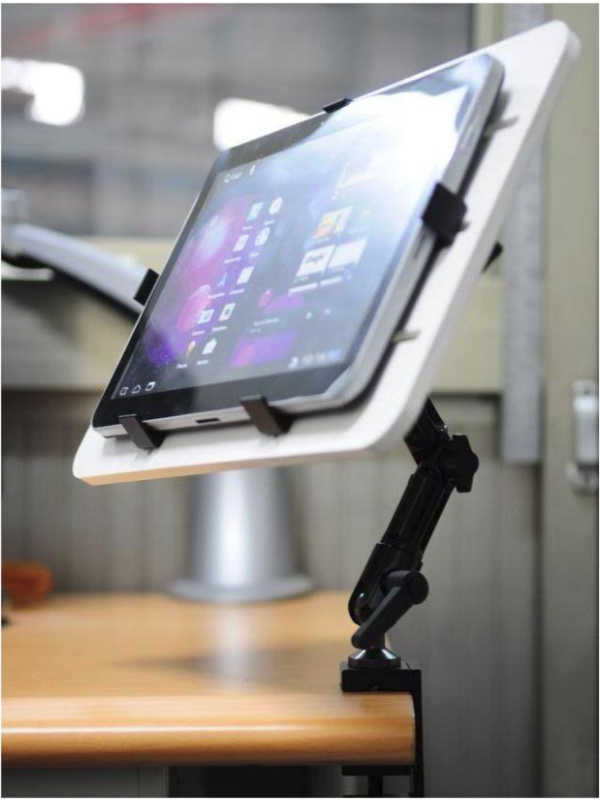 While using your tablets, you can adjust them for a lower viewing angle using our Tablet Mount for Desk Clamp DM-IP4. You can tilt the head, arms and desk connection up to 180 degrees. Its extension range is from 1 to 8.7 inches (2.54 to 22 centimeters). Or, you can add the accessory for longer extensions of 11.7 to 14.7 inches. When your workplace mounts are adjustable, it is easier on your eyes, neck and back. You don't have to crane your neck at odd angles to view your work. Others can see the tablet too. For long periods of time sitting, you can feel comfortable. Have you ever had a day where you started your shift behind? All day long, you spent your time running around to catch up. You kept standing because you were multi-tasking. With our CotyTech Tablet Mount for Desk Clamp DM-IP4, you don't need to waste time grabbing another desk clamp. Simply adjust it upwards for viewing while standing. You save time and energy and these qualities can be in very short supply on certain bad days. This table mount can hold ll lbs (5 kilograms). The rotation is 360 degrees. You can place your iPad, iPad2, GPS, Portable DVD, DVB-T TV or Tablet PC on one of our CotyTech tablet mounts. The total length is 8.7 inches (22 centimeters). Will these tablet mounts slip? No. Our teeth engagement joint prevents sliding. Our goal at CotyTech is to make ergonomic products to improve your tech life. Your technology should not be a battle field, it should be nice and easy. We provide the tools to integrate tech seamlessly into your life. Buy the Tablet Mount for Desk Clamp DM-IP4 to give you an ergonomic solution for reading your displays. When your workers are more comfortable and healthier, they are more productive. We, at CotyTech provide solutions for busy workers who are constantly switching between sitting and standing.